I guess many others have blogged about it, and now that we have a blog of our own, seems like we should join the crowd. Recently, we published a paper in PLoS Biology describing an effort we call the Gene Wiki. First, the Gene Wiki applies the concept of the Long Tail to the gene annotation process. The majority of content in existing gene portals and model organism databases is added by teams of expert curators. While this model allows centralized oversight of all annotation added, it also creates a severe bottleneck in keeping up to date. The Long Tail principle, of course, would allow the entire community to contribute and participate. The vast majority of these contributions are likely to be individually small, but collectively these contributions will be large. Said another way, the wiki concept enables efficient two-way communication of information, a model which was not previously widely available. The second primary motivation for the Gene Wiki was a focus on unstructured content. Existing resources primarily focus on structured data, typified by controlled vocabularies and data presented as tag-value pairs. In contrast, the Gene Wiki emphasizes unstructured data, a combination of free text, diagrams, photos, and figures. A Gene Wiki article can be read as prose, much like a review article in the literature. We think that the Gene Wiki will potentially be a useful tool for the community. Importantly, we believe that it will be complementary to existing resources, and it will require some level of sophistication by biologists to understand how the information should be used. But we’re confident that most users will understand the advantages and disadvantages of these different data models. To learn more, check out the pubcast and editing demo at SciVee. 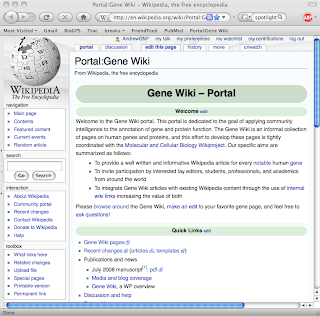 Of course, you should also visit the Gene Wiki portal itself to make an edit to your favorite gene page. Finally, we of course have featured the Gene Wiki prominently within BioGPS as its own plugin.